Each year, we offer new girls the opportunity to go to school at our three partner schools in Kathmandu. Education won't solve Nepal's many problems, but providing one girl a chance to go to school is a great step in the right direction. Girls are selected on the basis of economic need, and to a small degree, on academic promise. It would be great to think that all of our HIO children will be wonderful students, but we've chosen not to select our girls by pre-testing for academic ability. It's a wonder that with illiterate mothers, some of our girls turn out to be brilliant students. Two have graduated from Duke and Georgetown with 4.0 averages, but this is the exception. Most of the girls are average students. We encourage and help them to become better students and accept the notion that all have their gifts. The Nepali school year begins at the end of April. Placements of the new children are organized in June, and new sponsors are contacted with photos and a brief family story. 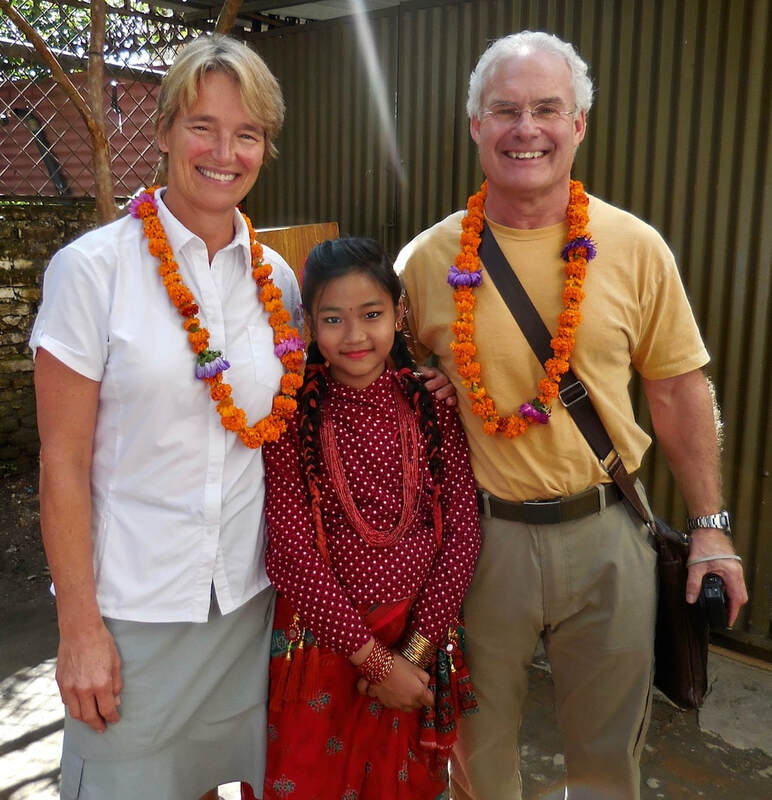 Beth and Jack Isler with their sponsored girl, Pooja, who is planning to go to medical school. 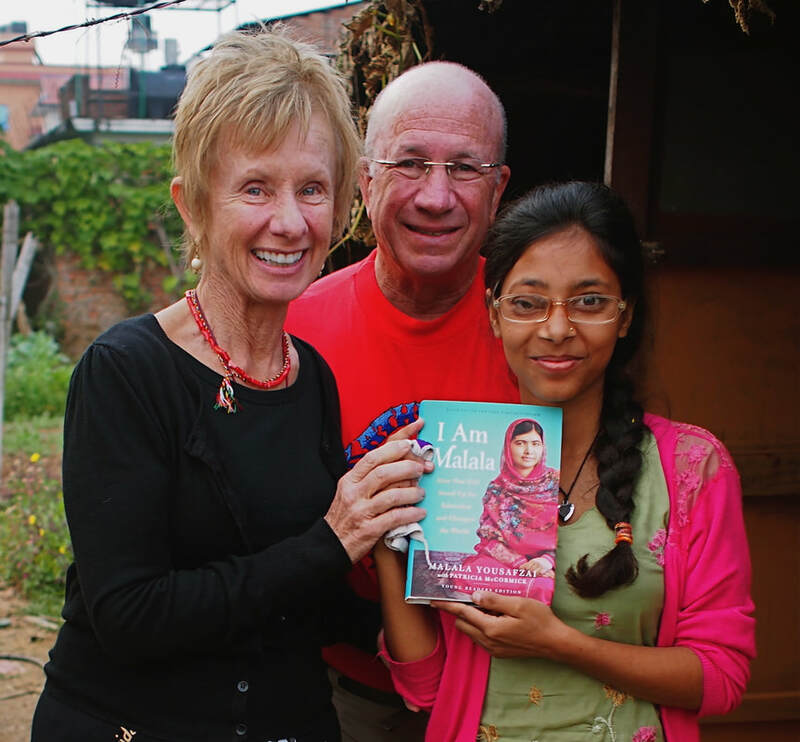 Alixe and Kelley Daniels visit with their sponsored girl, Puja. Often, in their daily travels to children's homes, Ram or Palmo, our Directors in Nepal, will peek into the doorway of a neighbor's rented room and find a very desperate situation. They once found an illiterate, single mother whose alcoholic husband had abandoned her, leaving her to support their five children, ranging from fourteen years to two months. Ram and Palmo asked many questions over several visits and decided that this family would greatly benefit if we sponsored one of her children. Others are suggested for sponsorship by social workers, school principals and teachers we know and trust. We often take on the younger sister of a girl we currently sponsor. We actively interview all prospective families over several home visits before making a choice. Ninety percent of the single mothers we partner with have not gone to school, and some are skeptical that education will change the lives of their children. Some, especially the fathers, believe that having educated daughters will greatly lessen their chances of finding husbands. Over time, we try to convince the parents that education can only improve the economic prospects of their daughters and is the pathway out of a life of poverty. HIO is committed to improving the overall quality of education in our partner schools through a program of active teacher training. This educational intervention not only affects the girls and young women we sponsor, but also makes a difference for the thousands of students in our partner schools and the community at large. We recognize the acute need for poor boys to receive a good education and for boys to become aware of the value of the presence of girls in their classrooms. For a literate democracy in Nepal to flourish, there must be a new generation of educated girls, along with boys who value and accept girls as equals in every way. nothing uplifts a society more than the education of its girls.